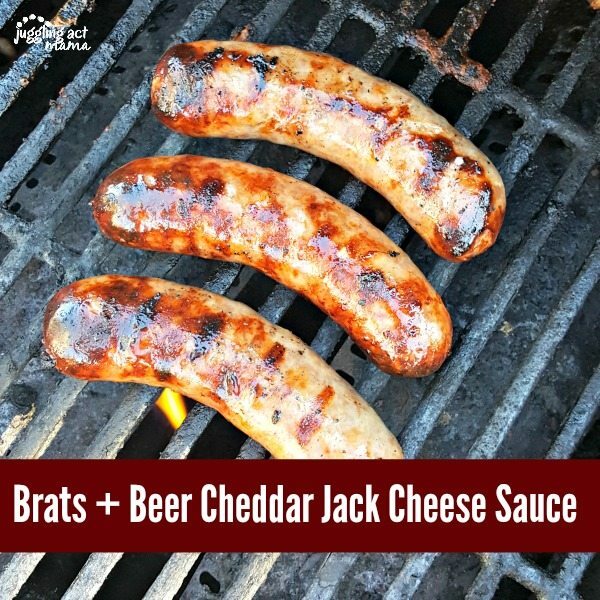 Make this delicious Brats + Beer Cheddar Jack Cheese Sauce combination for your next cookout and it’s sure to be a huge hit with everyone! 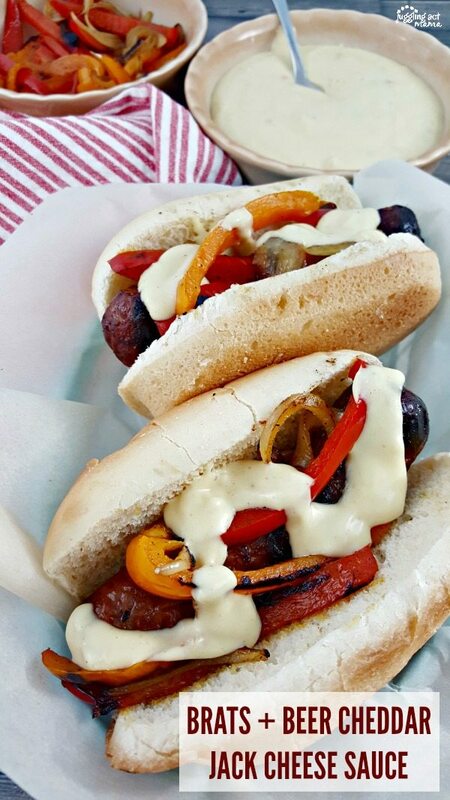 Mr. Juggling Act loves sausage and peppers with his brats, but I decided to kick the traditional recipe up a little with my Cheddar Jack Cheese Sauce. 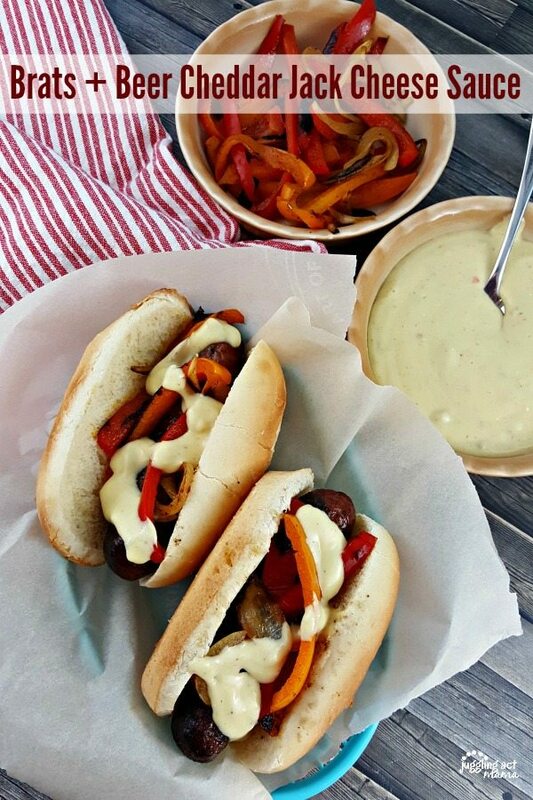 These Brats + Beer Cheese Sauce are awesome for a crowd and so simple to make. You can chop the onions and peppers up ahead of time. 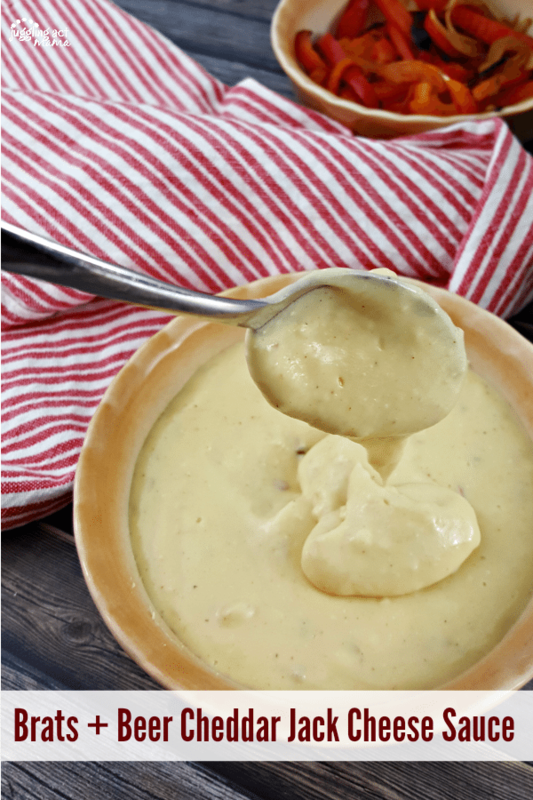 And while the brats are cooking on the grill, you can whisk together this delicious spicy beer cheese sauce. 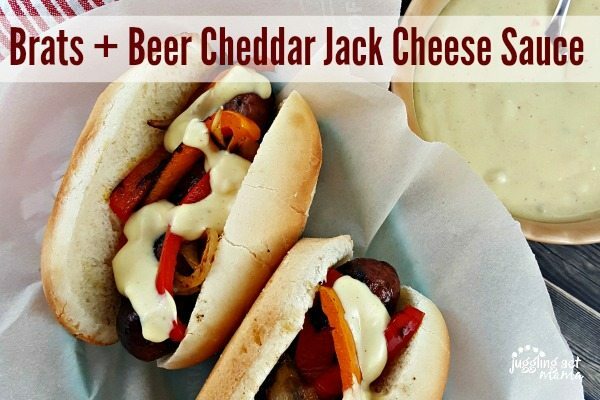 This beer cheese sauce is amazing on grilled brats. it adds a dimension of creaminess and brings out the smoky flavor perfectly. Here are some other ideas for the sauce. Make a big batch and use it as a condiment on the following foods. Homemade pretzels are some of the most indulgent comfort foods. This sauce has a ton of flavor without an overpowering saltiness. It’s perfect for pretzels because you can use sea salt on the pretzels and still dip them in the sauce – it’s purely amazing. What is your favorite pasta? Increase your macaroni and cheese game by using my beer cheese sauce instead. Throw in some crumbled bacon or sausage for a completely new meal that your kids and family will love. Sure cheeseburgers are pretty amazing, (and my favorite cheese for burgers is cheddar jack cheese) but slather a grilled burger with this beer cheese sauce! Add some grilled onions, sautéed mushrooms, and bacon for an unbelievable burger. This sauce is so simple to make, and you don’t need very many ingredients for it. 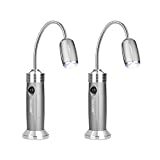 Lots of these are items you probably already have on hand. This is going to become your new favorite sauce. You’ll discover new ways to use it, but our favorite is right on top of grilled brats. Melt the butter in a skillet and cook the onions until tender over medium heat. Add the cream cheese and whisk it into the onion and garlic mixture. Gently pour the beer into the skillet and heat until bubbling. Add the yellow and ground mustard, and paprika. A little at a time, add in the shredded cheeses, whisking until smooth before adding more. Season with salt and pepper to taste. For an extra kick, add a punch of red pepper flakes. Serve hot on top of brats. The cheese sauce is so delicious that you’re going to want to put it on everything. In fact, if you have leftover brats, chop them up into small pieces, sprinkle them over tortilla chips and layer on the cheese sauce. Bake in the oven until everything is warm through. If you want to add some spice, flavor, or texture to the cheese sauce, here are some ideas for fun variations. Feel free to make this your own. If you make it, please post it on Instagram and tag #JugglingActMama so I can see it. For some spice, add a dash of hot pepper sauce. You can also add in some jalapeno peppers. This will taste amazing on the brats! I am a huge fan of bacon, so add some crumbled bacon too. Swap out the bacon for some spicy sausage too. I love the paprika in this sauce, but you can also add some ginger for more spice! What Type Of Beer Is Best For Beer Cheese Sauce? Beer cheese sauce is a traditional Wisconsin condiment. You’ll find lots of recipes for Wisconsin beer cheese soup and other variations with these ingredients. If you want to go for authenticity, use a Wisconsin beer. If you can’t find a Wisconsin beer, make sure you go for a beer with lots of body and flavor. Skip the light beer and dark brown beers. Light beers don’t add enough flavor and the dark browns will give the sauce an unappetizing color. Instead, use a light red or brown ale, with more malt and not so many hops. Miller High Life is perfect. As you can see, I prefer the bold flavors of the combination of cheddar and pepper jack cheese. Both of them have a fantastic melting point too. It’s easy to find them at grocery stores, readily available in the refrigerated cheese section. These 2 kinds of cheese really are the best to use for my sauce. Some other cheeses you might want to try include Havarti (for the creaminess) or Muenster (for the mild flavor and amazing way it melts). 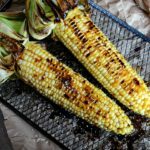 Here are a few of our other favorite dishes to grill up! 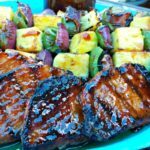 If you enjoy grilling, check out these recipes from bloggers I recommend! Grilled Beef Tenderloin Sandwich With Spicy Steakhouse Aioli – The Suburban Soapbox – The flavor for this sandwich is packed in the amazing aioli. Make sure you have a drink handy! 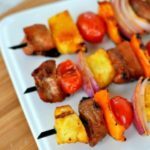 Grilled Beef Kofta Kabobs with Tzatziki – Bellyfull – The flavors of the Mediterranean permeate these beautiful kabobs. These are perfect for sharing with guests. Key West Grilled Chicken – Budget 101 – What makes this chicken taste like the Florida keys? The marriage of cilantro and lime. It’s the perfect summer meal. That recipe sounds awesome. What a great way to spice it up a little! I am seriously craving this now! My family is going to flip over this recipe – thanks for sharing! Pinned! OMG that cheese sauce – I have to try that combo! Yum!